Juneau ziplining is both an incredibly fun outdoor adventure activity and an exciting way to experience Alaska’s temperate rainforest high up in the canopy! 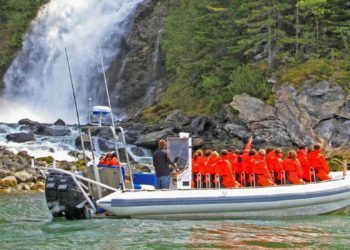 Juneau zipline tours don’t get more exhilarating than this, which could be why the Alaska Zipline Tour is currently ranked #1 of 88 Juneau shore excursions on TripAdvisor. Your high-flying adventure begins in the heart of the Tongass National Forest at the Eaglecrest Ski Area. No hand-braking is required on this unique zipline course, so you can simply sit back and soar through the canopy while expert guides handle all the equipment necessary for your safety. The course takes you soaring through the treetops with panoramic mountain views in every direction, stopping at fully enclosed treehouse platforms along the way to catch your breath and take photos before crossing a suspension bridge over a rushing mountain stream. Then, after you big Juneau ziplining thrill, it’s back to the base lodge for snacks, refreshments, and the chance to try your hand at axe-throwing, just like a lumberjack! Juneau zipline tours begin with pick-up near the cruise docks in downtown Juneau. Your guide will meet you here, and transport is provided for the short drive to the Eaglecrest Ski Area. At the lodge, you’ll receive a safety briefing, and your expert guides will set you up with all the gear needed for you to go flying through the treetops. Then it’s time to take off and enjoy your thrilling “flight” over the forest floor along seven ziplines. 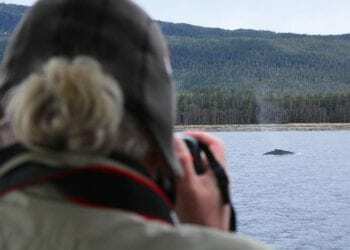 You’ll reach ten platforms along the way where you can stop and enjoy a refreshing cup of blueberry tea while your guides tell stories of life in Southeast Alaska and share their knowledge of the local flora and fauna. Back at the lodge, there’ll be snacks and refreshments waiting, a chance at axe-throwing, and a slideshow to relive the excitement of your Juneau ziplining experience before transport back to the cruise docks. Juneau zipline tours don’t get better than this, so be sure to book early for this awesome Alaskan experience! The minimum age for participants is 8 years old and all participants must fall between 70 lbs. and 250 lbs, no exceptions. Answer: This tour consists of 7 ziplines, 10 platforms and an aerial suspension bridge (with a cable we clip you into above that and hand rails to hold onto along the way). The lines vary in length and height throughout the course. Why makes this zipline tour different from any other in Alaska? Answer: Well, we can always recommend using feedback from previous participants as a starting point, and TripAdvisor has this zipline tour rated the #1 activity in Juneau! This tour takes place high up on Juneau's Eaglecrest Ski area, providing great panoramic views of the valley below and mountains in the distance. This tour is also a certified eco-tour by Sustainable Travel International, built with many recycled materials and operated in an eco-conscious manner. How do you slow down on the zipline? Are there brakes? Answer: This course does not require participants to "hand brake" themselves. This zipline course is designed to bring people onto the platforms appropriately, and there is a back-up mechanical brake that the guide controls, so you are not responsible for putting your hands on the cables to slow yourself down. Hand braking can lead to injuries if the participant is not careful, so we have eliminated that risk to enhance your personal experience. You can now relax and enjoy the ride! Answer: This course is routinely inspected to meet or exceed the ANSI-accredited ACCT guidelines. The steel cable that was used to build this course can hold 27,000 lbs, and there are even back-up cables throughout the course as well, so you are clipped into 2 lines rather than just one. You will be clipped in by your guides throughout the entire tour, and you have a back-up clip in point to put your mind at ease. All of the gear meets National Fire Protection Agency standards, and our guides go through extensive safety training and have First Aid & CPR certifications. They will give you a detailed briefing before the tour begins, and you can take comfort in knowing that thousands of happy customers have zipped through our tour before you. Answer: Some guests show up with the clothes on their back and the smile on their face. Other guests show up with a small backpack that contains an extra clothing layer, a bottle of water, a snack and other personal items. So, it's up to you! Space is often limited on the shuttle, so it's best to keep your items to a minimum, but bring what you need. 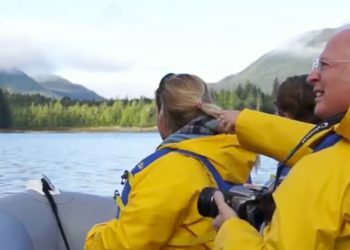 While on the tour, you're welcome to use your camera to snap photos of the beautiful scenery, yourself and your group! A smaller camera works best, but if you're comfortable bringing your DSLR you may; however, they can be burdensome while zipping at times. Keep in mind that you will be several stories above the forest floor at times while ziplining, so if you drop your camera it will likely not survive; for this reason, be sure that your camera has secure neck & wrist straps or is compact enough to fit in the small zippered hand pocket of the provided rain jacket. If bringing a large camera, the staff ultimately determines if your camera may be taken on the course, as it pertains to your safety and the safety of other guests and our guides. Once you arrive at the zipline course, your guides will collect the group's belongings and secure them at the lodge. Upon returning to the zipline lodge after your exciting tour, you will be able to quickly retrieve your personal items!